On April 21, 2008, New Atlantis contributing editor Robert Zubrin, author of the 2007 book Energy Victory, debated Robert Bryce, author of Gusher of Lies: The Dangerous Delusions of “Energy Independence” on the Michael Medved show. On April 2, 2008, Robert Zubrin discussed biofuels and his 2007 book Energy Victory on Canada's Business News Network. Robert Zubrin is a New Atlantis contributing editor, a fellow at the Center for Security Policy, and the president of Pioneer Astronautics, an aerospace engineering R&D firm. He also leads the Mars Society, an international organization dedicated to furthering space exploration. For many years, he worked as a senior engineer for Lockheed Martin. He holds a doctorate in nuclear engineering, and has nine U.S. patents granted or pending. In addition, he is the author of the critically acclaimed nonfiction books The Case for Mars, Entering Space, and Mars on Earth; the science fiction novels The Holy Land and First Landing; and articles in Scientific American, The New Atlantis, American Enterprise, the New York Times, and the Washington Post. He has appeared on major media including CNN, C-SPAN, the BBC, the Discovery Channel, the Science Channel, NBC, ABC, and NPR. 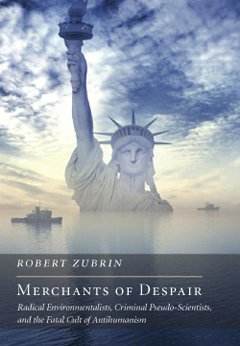 Mr. Zubrin’s latest book, Merchants of Despair: Radical Environmentalists, Criminal Pseudo-Scientists, and the Fatal Cult of Antihumanism, is the newest addition to the New Atlantis Books series. Merchants of Despair traces the pedigree of the ideology that human beings are a cancer upon the Earth — a species whose aspirations and appetites are endangering the natural order — and exposes its deadly consequences in startling and horrifying detail. It exposes the worst crimes perpetrated by this antihumanist movement, including eugenics campaigns in the United States and genocidal anti-development and population-control programs around the world. And it provides scientific refutations to antihumanism’s major pseudo-scientific claims, including its modern tirades against nuclear power, pesticides, population growth, biotech foods, resource depletion, industrial development, and, most recently, fear-mongering about global warming. The book’s official homepage is www.MerchantsOfDespair.com. Mr. Zubrin’s 2007 book on energy policy, Energy Victory: Winning the War on Terror by Breaking Free of Oil, was excerpted in The New Atlantis here. He discussed his book in a lecture at the Ethics and Public Policy Center in November 2007; to watch the video, click here. The book’s official homepage is EnergyVictory.net. In connection with his writings on energy policy, Mr. Zubrin occasionally contributes to the “Set America Free” blog. Mr. Zubrin can be reached at zubrin@thenewatlantis.com.